Since 2001, I have been vigorously working on building a successful pet sitting business. I have read. I have studied. I have listened. I have researched. I have analyzed. I have implemented. I have streamlined. I have stretched. I have written. I have made mistakes and I’ve experienced amazing results. All in all, it has been a fun and fulfilling journey. Since so many pet sitting business owners have reached out to me asking for help and mentorship with their own businesses, I decided to assemble my knowledge and expertise into a paint by numbers process/method that pet sitting business owners can follow and implement to achieve the same excellent results. In my many years in business I have come to understand that attracting pet sitting clients and building a successful pet sitting business comes down to this 9-step process, which I have titled, The Pet Success Nanny Success System™. This is by far the most important and the most overlooked piece of the entrepreneurial puzzle. Mindset is 90% the reason for success or failure. We examine how you prioritize your day and organize your business and your life. We find those “leaks’ that are stripping you of valuable time to grow your business. We will examine what it is about your pet sitting service that makes it unique, as well as figure out what you offer specifically in terms of results and benefits. We study your competition and how you can make your service shine in comparison. First, we identify who your ideal client is and how you are their “problem-solver.” We will then craft a compelling marketing message that will have these ideal clients calling you ready to sign-up as opposed to you chasing them. Finally, we discuss the best ways to reach them and turn them into paying clients. We will evaluate your pet sitting and dog walking services and develop the best pricing strategies and packages for your business. Your website is the cornerstone of your business. We will implement my step-by-step plan to create a powerful and functional site that will pull clients in. We also discuss how to develop a strong online presence that will drive traffic to your site. We will develop a specific marketing plan for your business to reach your ideal clients with your compelling marketing message. Each piece of the pie needs to be implemented consistently and systematically to constantly create a stream of new business to your pet sitting service. You will learn the best practices and systems to keep your business running like a well-oiled machine. I will teach you how to build a competent team of dedicated pet care professionals. You will also learn the best practices of managing your team and retaining them long-term. This is what I teach my high-level, private coaching clients. I teach them this clearly laid-out, step-by-step plan that they can start implementing immediately to build their own successful pet sitting and dog walking business. Well, I have some VERY exciting news. Da da da… I have now created The Pet Nanny Success System™ Home Study Course, so that all motivated, pet sitting business entrepreneurs can have access to this proven, highly-effective plan of action to multiply their businesses. What exactly is this The Pet Nanny Success System™? It’s the complete, step-by-step course that teaches you exactly how to build a successful and profitable pet sitting business. These simple and easy to follow steps will revamp your business by first setting you up for success through mindset and organization. Second, you will attract tons of new, ideal clients by transforming and maximizing your marketing strategies and online presence. Next, you will create profitable packages and finally you will develop effective systems and best practices to manage and expand your growing enterprise. 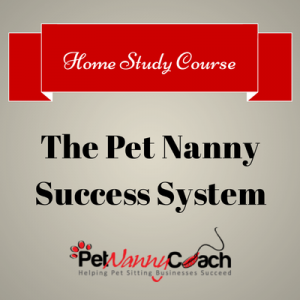 In short, The Pet Nanny Success System™ is your ultimate roadmap to building a successful pet sitting business.